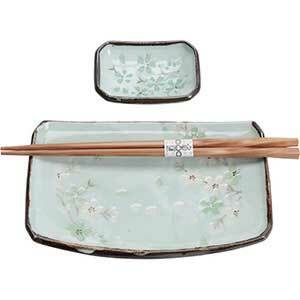 Present your sushi in traditional Japanese style with our collection of sushi serving sets. Browse Everything Chopsticks' sushi dish sets and serving plates. 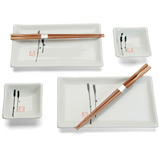 Dining for one doesn't have to be ordinary with this stylish sushi serving set for one! White dogwood blossoms on light green matte design. One plate (7.25 x 4.5 inches), one sauce dish (3.25 x 2.5 inches), and one pair of twisted bamboo chopsticks. Packed in a nice gift box. Microwavable and dishwasher safe. Made in Japan. Beautiful green leaves pattern Japanese dinner set with plates shaped like a long flat leaf and soy dishes shaped like small cupped leaves. 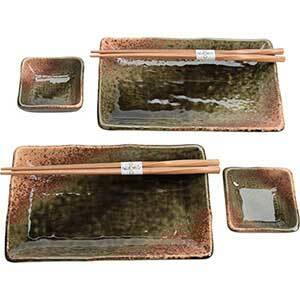 This set is excellent for serving sushi at the dinner table. Plates are 10.75 by 4.75 inches, sauce dishes are 3 by 2.75 by 1 inches. Chopsticks are of medium hardwood. Made in Japan.